Not ready to show off your skating skills in public ramps yet? You can now build your own halfpipe skating ramp and start practicing BMX or skating in your backyard. It may sound complicated or difficult for people who do not have wood working experience. Read on as this article makes the entire process of how to build a halfpipe skating ramp easier to understand for beginners. Based on the compound or space that you have, decide on the size and steepness of the skating ramp that you would like to build. For the materials, you will need pieces of exterior plywood, skateboard studs, pipes, lag screws and galvanized wood deck screws. Firstly, smooth out the surface of the sheets of plywood on one side. With a sawsall, cut the curve or slope with the first four pieces of plywood. All four pieces should have the same degree of steepness and you will have to make sure that the cutting is smooth. You might want to use the first piece of plywood that you have cut out as a template and draw the exact slope on the 3 pieces of plywood before cutting them. Secure a large piece of plywood in between two pieces of curved ones that you have worked on previously by nailing them with 3” screws. 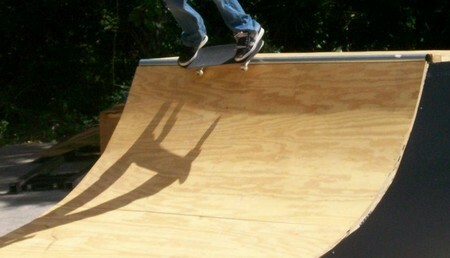 The dimension of the large piece of plywood depends on the size and width of your skating ramp plan. It should look like the frame of a halfpipe skating ramp. Cut out cross joists for your frame and start to screw them into outer layer of the frame by starting from the top of the curves. These cross joists will be supporting pieces of curved plywood later. For better support, you can create x-bracings with the remaining pieces of plywood and screw them underneath the ramp. Take out the sheets of plywood for the ramp’s flooring and screw them onto the cross joists. Follow the curve of the frame and make sure that the smooth side of the plywood is facing up. Wet the unfinished side of the plywood as it will cause the plywood curl up a little. It will be easier for you to nail the plywood pieces to the joists to form the curve. The plywood for the flooring must be pre-measured so that it fits onto the frame perfectly. When you have completed securing the pieces of flooring, you are basically done. Allow the skating ramp to dry up before applying finishing touches to it. You can paint it or put on double coatings of weather protection. Now, you already know how to build a halfpipe skating ramp!